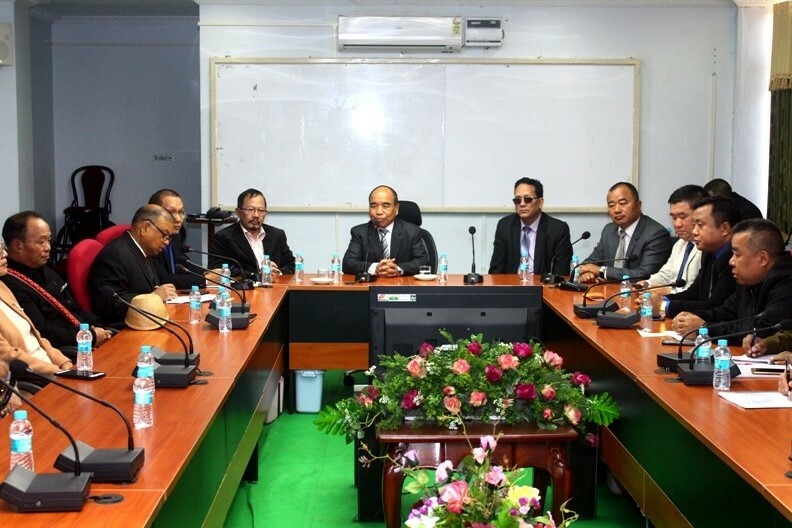 Leaders of Joint NGO Coordination Committee in a meeting with Mizoram Chief Minister Zoramthanga on January 25, 2019. The Mizoram Joint NGO Co-ordination Committee has agreed to partly compromise on its plans to boycott the Republic Day with minor adjustments after a meeting with the Chief Minister Zoramthanga and other Ministers of State on Friday. A meeting was called by the Chief Minister where representatives of all five NGOs – YMA, MUP, MHIP, MZP, MSU – of the Joint NGO Co-ordination Committee were present. Here Zoramthanga negotiated with the Joint NGO Co-ordination Committee on their plan to boycott Republic Day saying the day was of national importance and it was required of the government to conduct a programme. After holding consultation among themselves, NGO leader agreed to allow movements of VIPs of the state including the Chief Minister, Ministers of State, MLAs, MPs, Armed Contingents, State Secretaries and award recipients to attend the Republic Day Celebration programme. However, other government officials and public will not be allowed to attend the celebration. “While the appeal of the church and state leaders are very honorable, we have set out with a motive so we must go forward with it,” said the YMA President, Vanlalruata. The state leaders tried to further negotiate with the NGO committee not to hold public gatherings and to allow additional guests for various services, to which the MZP President Ramdinliana Renthlei said, “The government must make adjustments on their part as it is a boycott, and not a usual celebration.” The government officials were requested to reach the Lammual Grounds before 7 am. The association of church representatives called Mizoram Kohhran Hruaitute Committee(MKHC) had met the Joint NGO Co-ordination Committee on behalf of the government on Wednesday evening to request them to call off the boycott. The Home Minister had also convened a meeting on the same day with the NGO’s to request for the same.